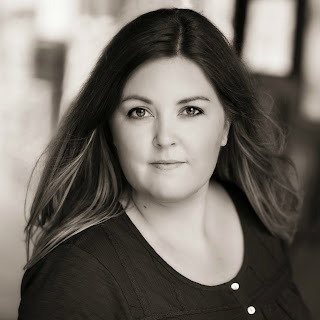 Daisy Chain Book Reviews: Guest Post: Catherine Ryan Howard Talks Writing Killer Plot Twists! Guest Post: Catherine Ryan Howard Talks Writing Killer Plot Twists! Did she leave or was she taken? Guest Post: Catherine Ryan Howard -- How to Write a Killer Twist! As a reader, I’m a sucker for a big twist. Ever since Tell No One by Harlan Coben, I’ve been seeking out crime and thriller novels where, right at the end, everything I thought I knew gets turned right on its head. I love the shock, the surprise and – if it’s done right – the satisfaction, because endings should be both utterly unexpected and yet also feel somehow inevitable. You should also, if you ever re-read the book, be able to find clues or nudges that were pointing you in the direction of the truth even though you didn’t realise at the time. As a writer, creating a plot that ticks all this boxes is incredibly challenging. With Distress Signals, I started out with the end. Then I asked myself, how can I frame this in such a way that the reader has no idea what has really happened until the last few pages of the book? At the very, very end, the opening scene was replayed again. This time, you realised with a dawning horror that the elderly couple hadn’t stopped to help. They’d stopped to make sure he was dead. THEY had run him over. What the writer had done was present a scene in such a way that the reader (a) had all the facts but also (b) didn’t put them together in the right way, at least not right off the bat. · What information does the main character need to figure this out? · When will he put it together? How will he? · What do I want the reader to think is happening (that isn’t)? · How do I frame this story so the reader doesn’t realise what’s really going on? · What kind of clues will I leave for the reader along the way? Remember: complexity can be layered in draft by draft. So in the first draft, my story was quite linear. The beginning was the “framing” of what really happened, the ending was the revealing of what really happened, and the bit in between was just the main character’s journey from knowing A to knowing B. But over time, as your story bolts get turned tighter and tighter and editing sparks all sorts of ideas, the story grows more and more complex. 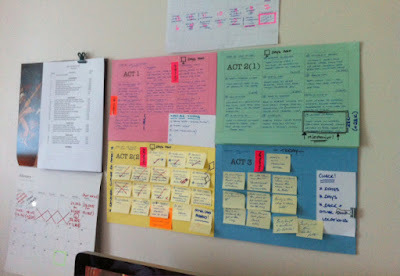 The chart/Post-It situation over my desk as I was writing the third and final draft of Distress Signals says it all, I think! The thing is, your pay-off – the reveal – has to be surprising and satisfying, because it’s easy to come up a situation that seems inexplicable, i.e. the set-up. In Harlan Coben’s new book, Fool Me Once, a woman sees her husband recorded on the “Nanny Cam” – even though she witnessed his murder. Now, anyone could come up with a scenario like that. The skill is explaining how it came to be in a way that thrills and surprises – which is exactly what the masterful Coben does (and apparently does without plotting or knowing the ending in advance? Dear God. Way to make me feel inadequate!) The hard part is accounting for it in a way that keeps the reader turning the pages and convinces them to recommend it to a friend after they’re done. Because if it doesn’t work, the whole thing is ruined. I’m still angry about a mini-series that aired on Irish TV a couple of years back about a missing girl that was all very intriguing and suspenseful, but in the end finished with all the impact of a speck of dust landing on an umbrella. They didn’t even explain what had happened – cheating, in other words. Sometimes it’s not cheating, but just disappointment that faces the reader. Years ago I was browsing in a bookstore when I picked up a paperback whose jacket copy really grabbed me. A number of children had gone missing from the same area in the space of a year, and had been missing for several years when they all returned, unharmed but with no memories of their abduction or where they’d been all this time. It was a crime/thriller, so you knew the explanation couldn’t be supernatural. I bought it because I HAD to know: what had happened? But the explanation was neither believable nor exciting. Remember, the ending is just as important as the beginning – maybe even more so, because the reader has invested so much time by then. 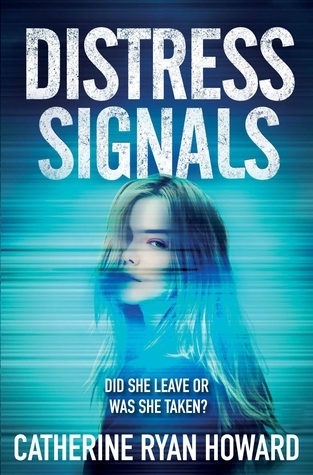 I do love a killer twist and the biggest compliment a reader could pay me is to say that they didn’t see the twist in Distress Signals coming. I hope that’s the case! Thanks to Catherine for such a great guest post! Watch out for my review of Distress Signals later this week. Spoiler Alert: I LOVED it!